Lent has started, meaning that the Greeks will try not to eat meat, nor fish having blood vessels. They throw themselves on vegetables and shellfish. The two lungs of the island of Lesvos, the Gulfs of Kalloni and Yera, are blessed with a rich variety of shellfish: oysters, mussels, clams and many others. 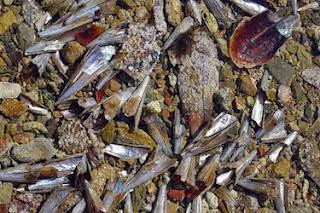 Those are the small ones, but in the muddy bottom lurk monstrous ones — the fan mussel (Pinna nobilis) can grow to over one meter and they can manage to live up to twenty years. I love eating shellfish, but cooked. Which is contrary to the Greek way, they just like oysters and other shellfish to slide raw from the shell into the mouth, with just a few drops of lemon juice (which goes over nearly all food). Seeing such enormous mussels, as a gourmand, you wonder how big is the animal that made the shell grow and how he would taste. I am pretty sure that they should belong in the Top Five of Tasty Shellfish, but no chance: they are an endangered species and are forbidden to be collected. Even though we stumble over masses of those huge shells on various beaches along the Gulf of Kalloni; elsewhere they are considered rare. Last year we were served pinna-balls in a restaurant. According to the cook they were made of those forbidden-to-collect shellfish (but they could have been easily made with other shellfish). I was a little disappointed with their taste, maybe because I also had a portion of those delightful scallops. So I will not ask for pinna-balls again, in order not to stimulate an illegal eating culture. Yesterday was the first warm spring day of the year and we drove to Anemomilos, a hill behind Skala Loutron, covered with gigantic villas (no Greek crisis there), and with stunning views over the blue Gulf of Yera. A little beach seduced us down to the motionless water and it was so hot that I was tempted to undress and have a swim in the transparent water that without any wrinkle gave an overwhelming view on colourful little stones and shells. I was being a little optimistic and only my feet touched the water. A little further on, over some rocks, there was another little beach where big silver sardines tried to push each other in order to reach the beach. Coming closer, in fact they were no sardines enjoying a day out, it looked more like a cemetery of fan mussels, lying like rusting skeletons in the water, their mother of pearl points sparkling in the sunlight. What a sad sight, additionally because many of them were pretty big. Could they have been doing a collective suicide, like dolphins or whales sometimes do? The question has not left my thoughts. Coming home I read on Face Book an article about sea silk (in Dutch, from Luc Lakeman, Blue Yard Hub). I totally forgot that those beautiful big mussels can close their shells shut with their hair (just think about those nasty hairballs you have to remove in order to open a mussel). These hairs are the sea silk and the material used for some exclusive and expensive clothing items. It made me fantasize further about the ‘cemetery’ and I wondered if there was somebody on the island seeing potential for a little sea silk business. A beginner who has not figured out how to harvest sea silk whilst keeping the fan mussel alive. The harvest should be made by divers cutting under water some of the hairs (not all). Then the threads can be washed and dried before the spinning. Those giant mussels also can produce pearls, although not of a high quality (there is a big chance that they will have burst). But I presume for treasure hunters it might be a kind of business. Could there have been somebody spending a day on that lovely little beach destroying fan mussels in order to find pearls? Luc Lakeman himself came with a more realistic answer to this riddle: probably some boats anchored there, destroying a whole village of fan mussels. I can pretty well imagine that, because the little beaches are right in front of a little island with a bright white little church on it: a dream of a setting for a picnic or a little outing. Lesvos should create a better awareness of these valuable shells, that elsewhere are hard to find. But now I am wondering about throwing out your anchor—how can you know what is at the bottom of the sea? It might be an idea for a new app. It was a splendid day. I should have dived into the water, looking for pearls. One of those many shells must have had some. But then I had to trample them even more, what I didn't wanted to do, because even though their sad destiny was clear, the view of such a ‘cemetery’ was an impressive picture.